In this episode, Suzaku and Seiryuu spend the whole time arguing about whether or not killing children helps their cause. On the plus side- no Miaka. Now that we're firmly entrenched in the affairs of the gods, things operate on a much larger scope. Any thoughts of beating Zhuqiaomon into submission have been retired. 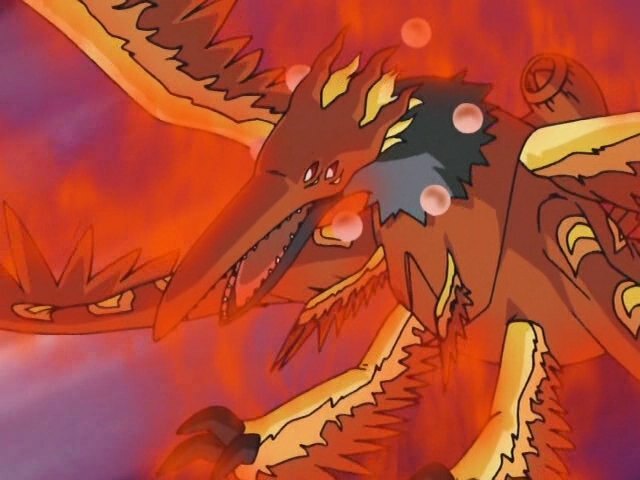 The priority now is surviving divine wrath, hoping that maybe they can talk him into reversing a course of action in which he has sacrificed months of time, his strongest knights and the very concept of Digimon progressing as a species. It's looking bleak. Credit the three Digimon partners for keeping their tamers alive through this. 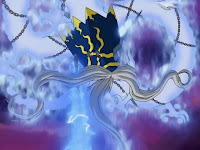 Taomon returns remarkably quickly after the previous battle to provide protection spells. 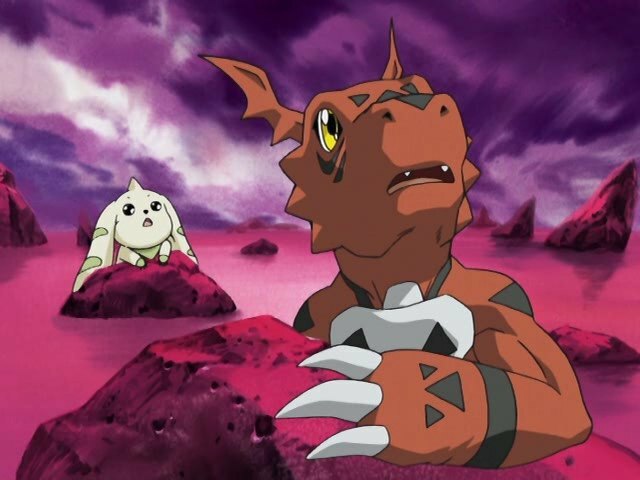 Terriermon and Guilmon can't evolve again so soon, but they throw themselves into the battle to at least give Zhuqiaomon a different target. This gesture is key because Takato realizes that he needs to replicate it to get Gallantmon back into the picture. He falls through Zhuqiaomon's attack to pull off the bio-merge, a visually impressive and damn gutsy move. Gallantmon isn't a huge factor in this battle, but you can bet Rika took notes for next episode. Ultimately, they were never going to accomplish anything against Zhuqiaomon. Somebody so anti-human and so committed to his plan isn't going to listen to the same kids that had destroyed his Devas. It takes a fellow god for that, so in strolls Azulongmon, everyone's favorite exposition-provider. While he delivers as much backstory here as he did in Zero Two, this time it's more as a second opinion. Most of the key points are touched on via argument. It's much more enthralling than last season's episode of Magic Dragon Storytime. It also raises some fascinating questions of strategy, with parallels to real-world military build-up, weapons testing and capitulation if we want to go that far (we won't). This “true enemy” is awakening, seemingly due to the Digimon evolving and progressing. The Sovereign respond by sealing away the catalyst of this evolution in the form of Calumon and expelling it to the real world. Stop there for a moment: is that sensibility or cowardice? It's an awful fate either way. For a growing and prospering species to feel that evolution is angering some mysterious force from below, and thus deeming it dangerous and clamping down on it. Whether or not it's the right decision, it's terrible to take what all creatures strive for and forcibly suppress it. Either way, it didn't work as this enemy continues to threaten the Digital World. Now the dilemma becomes whether to continue capitulating or fight back, seizing the catalyst and using it to evolve to the point where the Digimon can fight back. That second option just sounds right, possibly because we've been ingrained with a “never give up, never surrender” mentality since around the Etemon arc of season one. It's surprising, then, that this is Zhuqiaomon's mindset, and everything he and the Devas have done so far have been with this objective in mind. Now we know why Henry heard all that stuff about good and evil being based on perspective. While this sort of vindicates Zhuqiaomon and makes it very hard to call him a true villain, his anti-human kick is very unfortunate. This is ultimately where Azulongmon is most useful, suggesting that instead of being repulsed by humans and Digimon evolving together, they may be the key to stopping this D-Reaper thing. The kids may not have a lot to do in this episode, but at least we appear to finally have a real villain now. There's a neat implication where it's suggested that the Monster Makers are using grid computing to derive some of the more complicated algorithms necessary to get their ark operational. The idea of a massive collective operation to get these kids home is inspiring. We've seen Ryo noticing all the Megidramon-related disturbances, but how do those prompt him to find Baihumon? As much fun as Ebonwumon is and as cool as it is to see all four of the Sovereign in this series, there's not much of a point to Ryo's visit. How's Jeri holding up? “All we've seen is pain.” Nice to see she's doing well. The layout of the Digital World as a series of concentric circles surrounding the Earth, with D-Reaper as the extreme outer ring, is not only an awesome visualization, but creates an interesting distinction from the ways the world is constructed in Frontier and Fusion. Shibumi is still a Lain character. Nothing else to see here. Wasn't Cyberdramon the one who dragged Ryo to Ebunwomon? I think it was about this point that I began to feel a bit tired at times with Jeri's arc. I don't want to sound callous or dismissive, and I did like the darker and sadder direction this arc was working with. But it's hard to feel sorry for a character when she's already doing it to such an extent that she's spouting absurdities like that "all we've seen is pain", which is an obvious exaggeration and distortion. Seriously? I think her depression is actually a kick in the teeth to Leomon. The guy died assuring her that she was stronger than she thought she was. She could at least acknowledge that and question it instead of nosediving straight through the despair event horizon and then staying there, moping. Long story short, I felt this was one of Tamer's notable weaknesses: to take compelling drama, and then push it a bit too far on occasion. I just want to point out, HOW F**KING HUGE IS AZULOGMON?! Seriously, let's go through this a bit: MegaGargomon must be twice the size of the already enormous WarGrowlmon, but he was really no bigger than Zhuqiaomon's head. Zhuqiaomon must therefore be practically the size of VenomMyotismon, yet he's smaller than Azulongmon's face. I don't doubt he must be several miles long here. "That second option just sounds right, possibly because we've been ingrained with a “never give up, never surrender” mentality since around the Etemon arc of season one." Well... There is a line from the Data Squad theme song, "Never surrender, never be outdone", you know? Never give up, never surrender! By Grabthar's hammer, you shall be avenged! Okay now that *that'*s out of the way... Azulongmon is indeed my favorite exposition dragon, king dragon of snark. I wish we'd seen more of his snark in this season. I hope he comes back in 5+ (as I really dont' remember him in Frontier).